Reliance Precision (www.reliance.co.uk) is an independent, family owned engineering company with manufacturing facilities in Huddersfield and Cork, Ireland. Half of their business is derived from the scientific and medical sectors, whilst aerospace and defence accounts for a quarter of production. In January 2013, Reliance was asked to raise the quantity of a tightly toleranced defence industry component to 1,000-off per year for 5 years. The increased demand for the part prompted a review of the manufacturing process. The part was originally made on a 3-axis machine with a 2-axis tilting table, but significant manual intervention had been needed to achieve the required quality and the sub-10 micron deviation from true position required for certain features had proved particularly difficult. 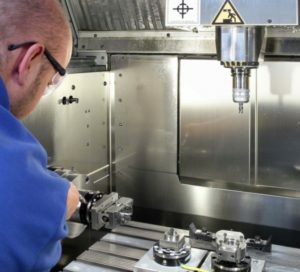 To meet Reliance’s requirements, Kingsbury supplied a machine based on a Hermle C 20 U vertical-spindle, 5-axis machining centre, but without the rotary table or trunnion. Instead, the left-hand trunnion drive was employed to provide a fourth axis, which together with a fixed machine table made it easier to achieve the very tight tolerances, without compromising productivity. The machine was supplied with an enhanced specification to guarantee five microns positional accuracy in X, Y and Z. With in-process workpiece gauging using a Blum probe in the spindle, the team at Reliance has greater confidence that parts are within tolerance, so far fewer need to undergo a 4-minute inspection cycle between the first and second operations. Thanks to their Hermle C20 U, the team at Reliance is now achieving the required quality for the part on a consistent basis, faster, and with less operator intervention. Machining time has been cut by nearly 30 per cent, cost per unit has fallen and inspection time has also been reduced.